Cobblers slipped to one of their worst defeats of the season when they were beaten 2-1 by lowly Port Vale despite playing over half the game with an extra man. It was all going so well with 44 minutes gone at the PTS on Saturday, at which point Town led 1-0 through Sam Hoskins' fifth-minute goal and were also playing with an extra man following Vale skipper Leon Legge's straight red card. But David Worrall equalised with virtually the final act of the half and the Cobblers fell apart in a terrible second-half performance, with Tom Pope's spot-kick condemning them to a hugely disappointing defeat. The full-time whistle was greeted by plenty of boos from home supporters and no-one can blame them. The Cobblers, whose eight-game unbeaten run now feels a lifetime ago, drop to 14th in League Two. Keith Curle responded to last week's loss at Cheltenham Town by making four alterations to his Cobblers team as he recalled Aaron Pierre, Marvin Sordell, Jack Bridge and long-term absentee Shaun McWilliams to the starting line-up. John-Joe O'Toole was one player to drop out while Jordan Turnbull failed to recover in time, but Cobblers were off to the perfect start with a goal inside five minutes. Bridge, back in the side for the first time since February 23, delivered a superb cross from a short corner and Hoskins positioned himself perfectly to tap home after Charlie Goode's initial header was blocked. Set-pieces would be a theme of the first-half and Town in particular carried a real threat from corners as David Buchanan's deep cross was headed back across goal by Ash Taylor for Hoskins, who flicked over on the edge of the six-yard box. There were occasional moments of alarm for the home defence but Vale managed only half chances with David Cornell easily holding onto a header while Tom Conlon sliced over from range. A slick move through the middle almost brought Town a second goal when Bridge spun his man on halfway and found Sordell, who slipped it back into Bridge inside the box but the midfielder snatched at his shot. Ricky Miller was then inches away from converting Mitchell Clark's low cross but Vale's task became far header three minutes before half-time when visiting skipper Legge cynically hauled down Andy Williams as the last defender, leaving referee Neil Hair with the simple decision to bring out the red card. However, Vale defied their numerical disadvantage to level on the cusp of half-time when Worrall pounced on sloppy defending, winning back possession and allowed to run clean through on goal before sliding underneath the onrushing Cornell. Vale, clearly buoyed by the goal, started the second-half on top and Kyle Howkins headed at Cornell and Ricky Miller was close with two long-range attempts. Despite struggling to make their extra man count, Town really should have restored their advantage when Goode picked out Pierre inside the penalty box but the defender fluffed his lines. Curle had seen enough and replaced Williams and McWilliams with Dean Bowditch and Timi Elsnik but there was little improvement from his team and, as it turned out, that miss from Pierre would be Town's last genuine chance of the game. So poor were the Cobblers during the second-half, it came as no surprise when the visitors moved in front. With 15 minutes to go, Goode was adjudged to have bundled over Cristian Monatno in the penalty box and Pope, only just on, converted from the spot with his first touch of the game. 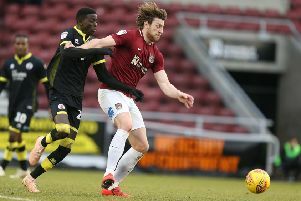 The Cobblers had produced nothing since half-time to suggest they were capable of making a late comeback and that continued to be the case in a horribly disjointed end to the game. It should have been worse for the home team too as Howkins shot over from a good position late on, although that didn't matter as Vale comfortably played out four minutes of stoppage-time to claim a precious win in their relegation battle.